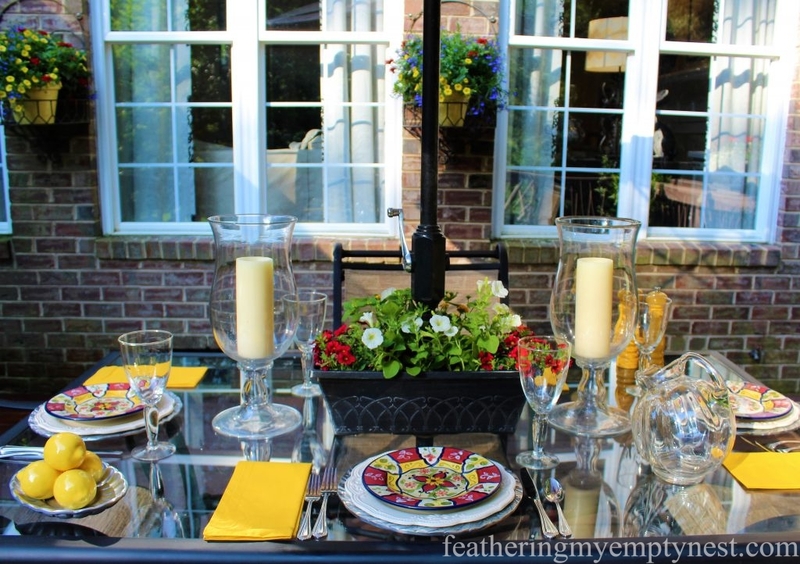 May is the perfect time for alfresco dining in the Carolinas. The trees have completely leafed out, so the thick layer of sneeze-inducing pollen that covers absolutely everything in the Spring finally can be washed away. And the mornings and evenings are generally cool enough to sit outside without melting into a sweaty puddle. With this in mind, I spent the weekend before last power washing my deck, my screened porch, and all my outdoor furniture. Having washed away the pollen and sadly, some of the finish on the boards as well, I was anxious to decorate. 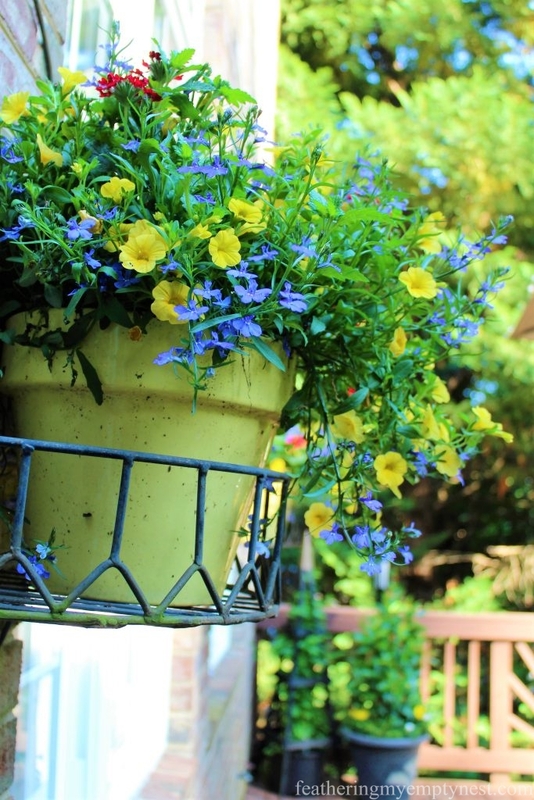 The primary way I add color and interest to my deck is with summer flower planters. Because it is easy to get overwhelmed at the garden center, I decide on a color scheme in advance and then only buy plants in those colors. This year, I chose a palette of red, yellow, white, and blue. I then proceeded to scour the aisles of my local Home Depot, Lowes, Walmart, and Pike Nursery, to locate a color-coordinated collection of blooms to fill all of my flower planters. 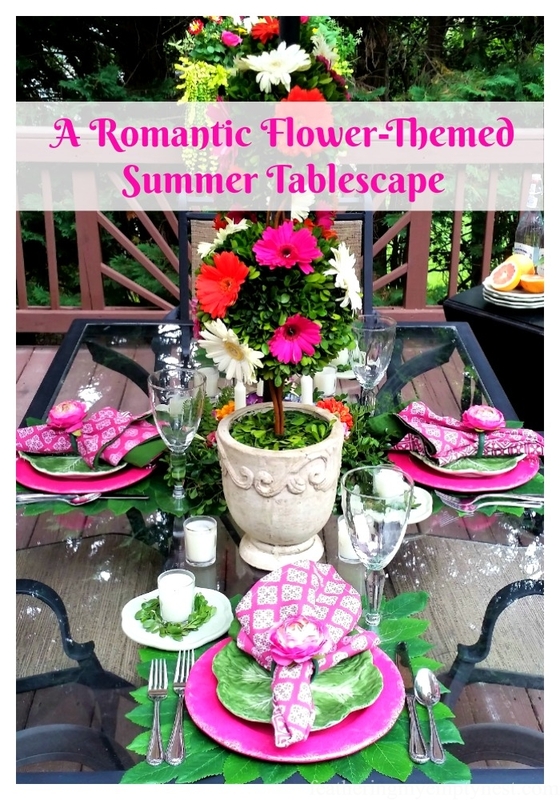 Since our deck is primarily a dining space, I like to have flowers on the dining table. In the past, I’ve just placed a pair of potted plants on either side of the umbrella on the table and called it done. However, because the two pots take up a lot of valuable real estate on our relatively small table, I end up removing them when we eat– which kind of defeats the purpose. When I investigated alternatives, I could only find round ready-made umbrella tabletop planters. Because I wanted a long narrow planter, I decided to create my own rectangular planter. 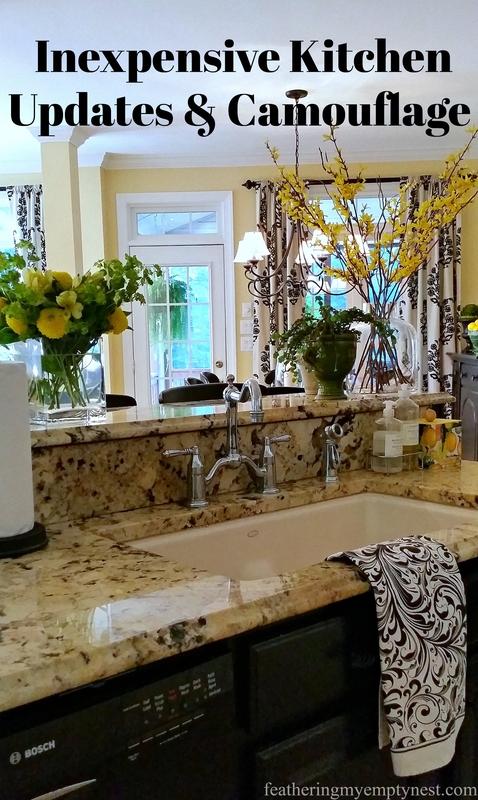 For this project, I started with a window box that wouldn’t take up too much space and could remain on the table all the time. First, I used heavy duty scissors to cut an umbrella-pole-sized hole in the center of the plastic window box planter. I cut a similar hole in the bottom of a small round nursery plant pot. 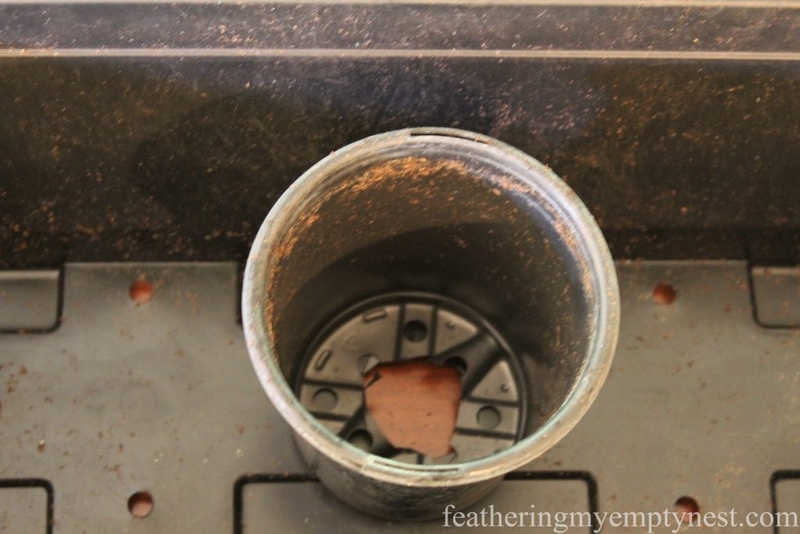 I placed a ribbon of JB Waterweld Putty Epoxy around the bottom edge of the small pot to create a waterproof seal. Lining up the holes, I stuck the small pot down inside the larger planter. After about 20 minutes, when the epoxy set up, I threaded the umbrella pole down through the holes in both containers. Then I filled the rectangular planter with potting mix, making sure to keep the soil well below the top of the smaller pot. The smaller container will protect the pole from the dirt and prevent dirt and water from escaping through the hole in the table. Because I find plants do best when they can drain, this planter has holes in the bottom. My table is glass, and I don’t mind if it gets wet when I water. 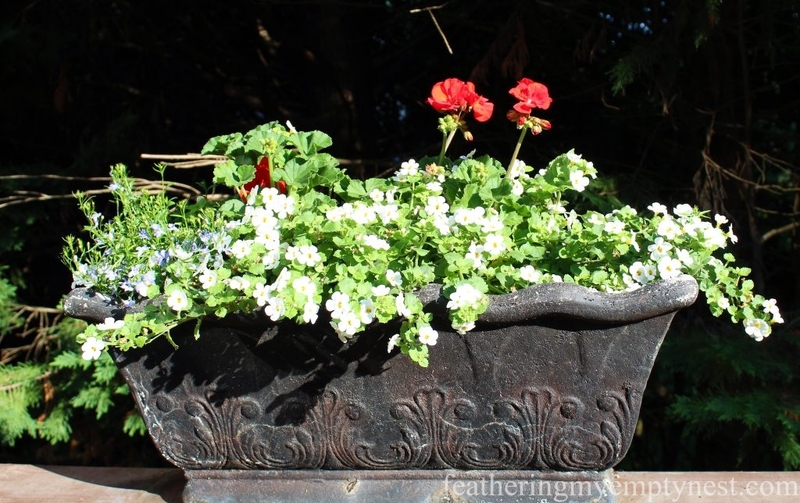 But if that doesn’t work for you, you can simply use a planter without drainage holes in the bottom, or you can line one that has holes with heavy-duty plastic. If you chose to do this, just be careful not to over water your flowers. 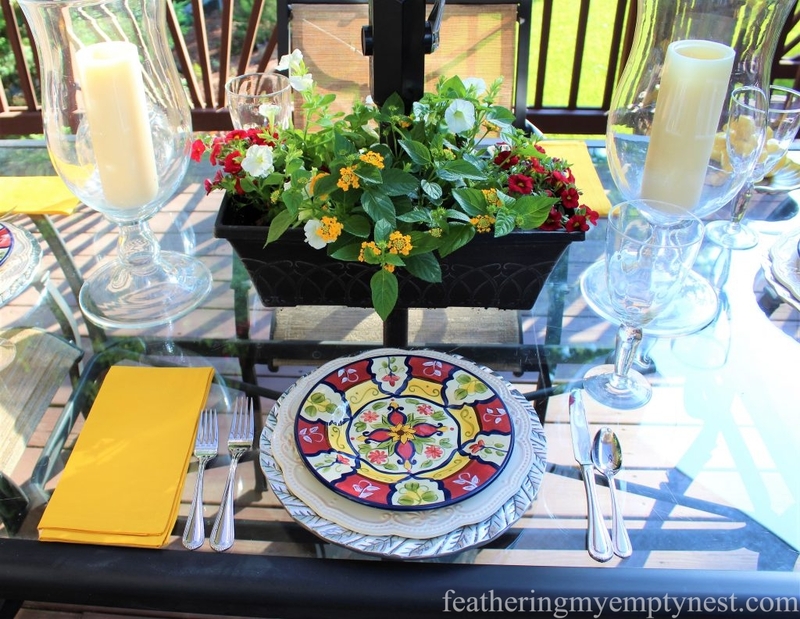 The yellow and red place setting coordinates with the summer flowers in the planters on the deck. 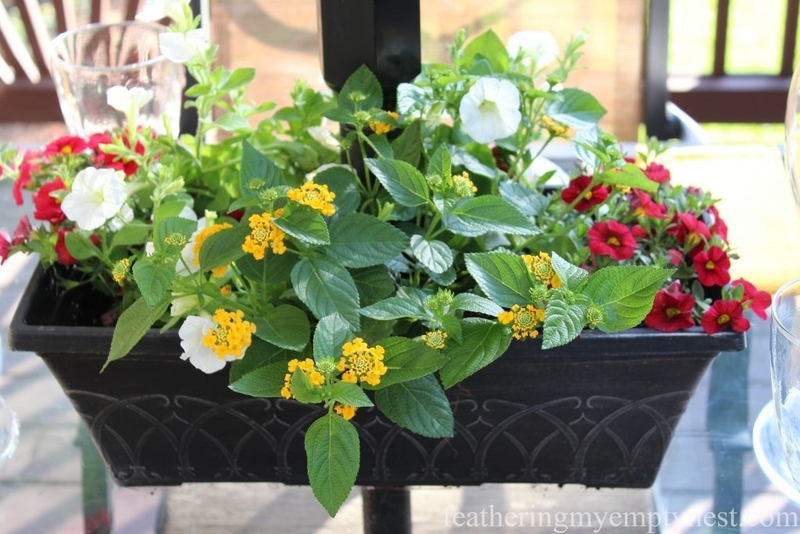 I chose white Petunias, Trailing Red Million Bells or Calibrachoa, and yellow Verbena for the table planter, as they are all low growing and will not get tall enough to interfere with the umbrella when we need to close it. While I annually change up the containers and the flowers I plant in them, the two window boxes that perch on the deck railing stay in place from year to year. When deciding which blooms to combine in my summer flower planters, I try to consider the old container gardening adage which suggests including “a thriller, a filler and, a spiller.” In the case of my window boxes, my “thrillers” are large bright-red Geraniums. The small white Snowstorm Bacopa and the Laguna Skyblue Lobelia are both fillers and spillers, as they will spread and fill out the planter and trail over the side. As the flowers grow throughout the season, the combination of the red, white, and blue “thrillers and spillers” should make a striking display. If you read my post about last Fall’s front porch decor, you will recognize this pair of trellis obelisks that I entwined with faux autumn greenery and used on either side of my front door. 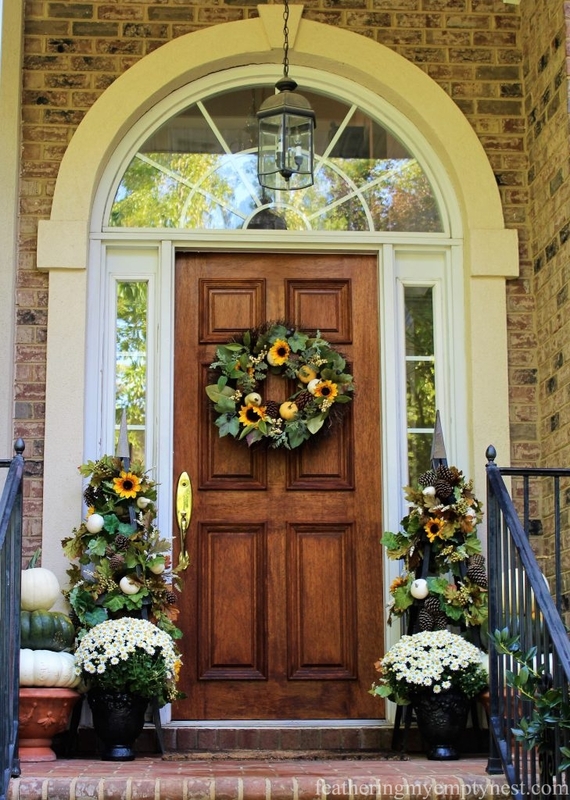 Fall front door decor with obelisks. 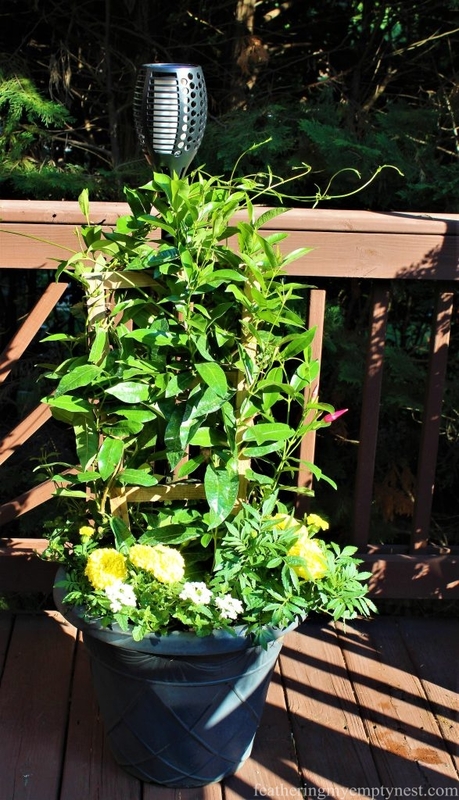 Since I like the idea of having something tall to anchor the far end of the deck, I had the idea of placing the obelisks in large pots of flowering vines this summer. However, after shopping around quite a bit, I discovered that it was impossible to find inexpensive pots large enough to accommodate the bases of the obelisks. So, instead of putting the obelisks inside planters, I decided to place them over containers of trellised Trumpet Creeper. While these fast-growing vines are not blooming yet, hopefully, they will soon cover the obelisks with beautiful yellow trumpet-shaped blooms. 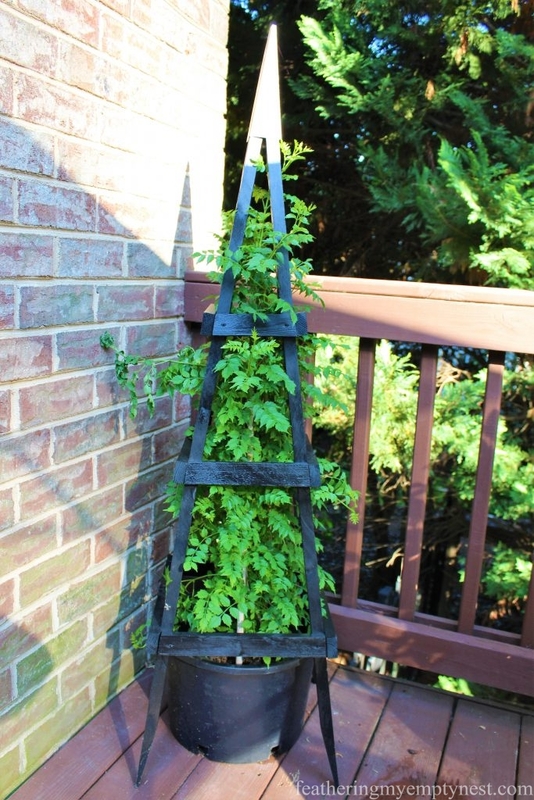 Trellis obelisks offer height and architectural interest to the deck while providing a framework for the soon-to-be colorful climbing Trumpet Vine. For more “viney” finery, I planted trellised Mandevillas in large planters next to the obelisks. I under-planted the tropical red Mandevillas with trailing white Superbena and yellow Lantana, as well as some sunny large-headed African Marigolds. As an experiment this year I placed solar torches in these pots. I’ll let you know If they produce a decent light at night, and if so, I may add more solar lighting to the deck next year. 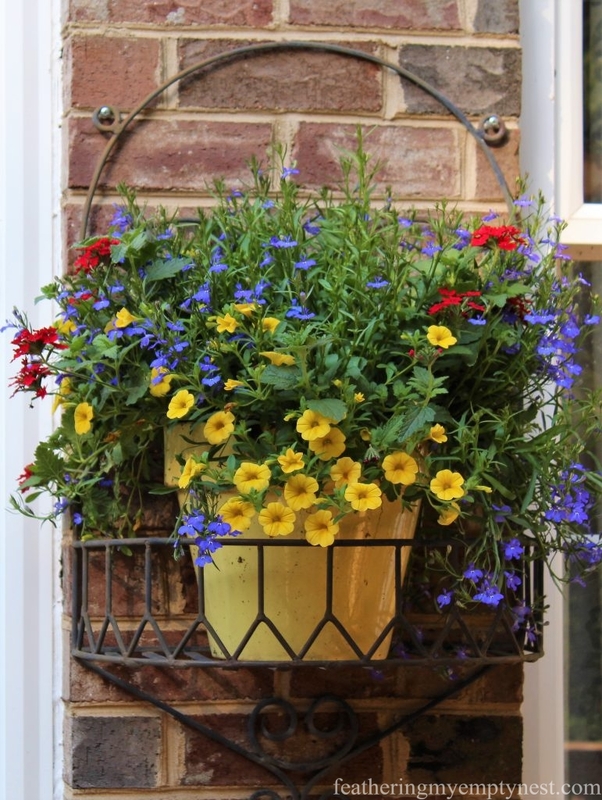 The yellow pots in my wrought iron wall basket planters are packed with blooming color. They contain yellow Superbells, dark blue Lucia Lobelia, and red Superbena. I confess I broke the thriller, filler, spiller rule with these pots as they are basically all spillers. I couldn’t resist them because they already look quite pretty and I will not have to wait for them to bloom or grow out to enjoy them. I am a little leery about how the lobelia will do in the blazing afternoon sun. They are a bit more delicate than the verbena and the million bells, but I love their color, so I decided to give them a try. 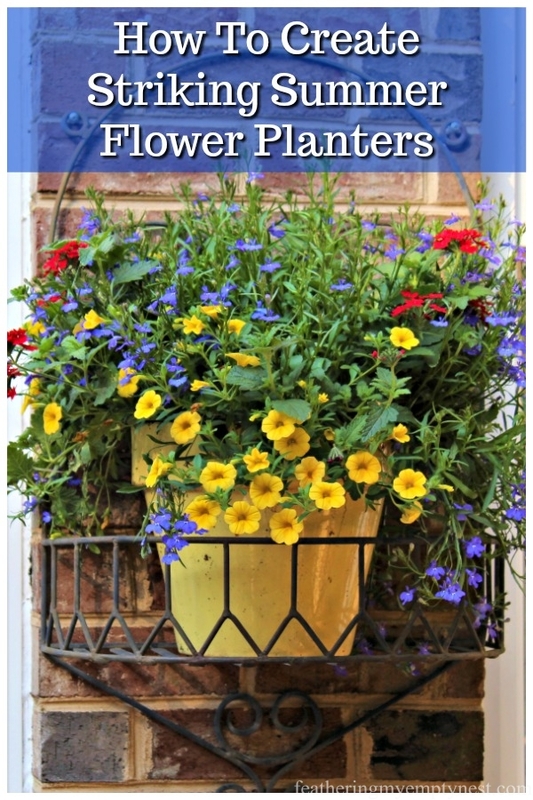 As any gardener knows, creating successful flower planters is a bit of a crapshoot. You try to plant species that thrive in similar conditions, but you never know if they will do well together in a given space. Some years my efforts turn out really well, other years, not so much. Because of this, I may have to make some changes to my flower planters as the season goes on. So be sure to follow me on Facebook and Instagram as I will be posting updates showing how they fare. 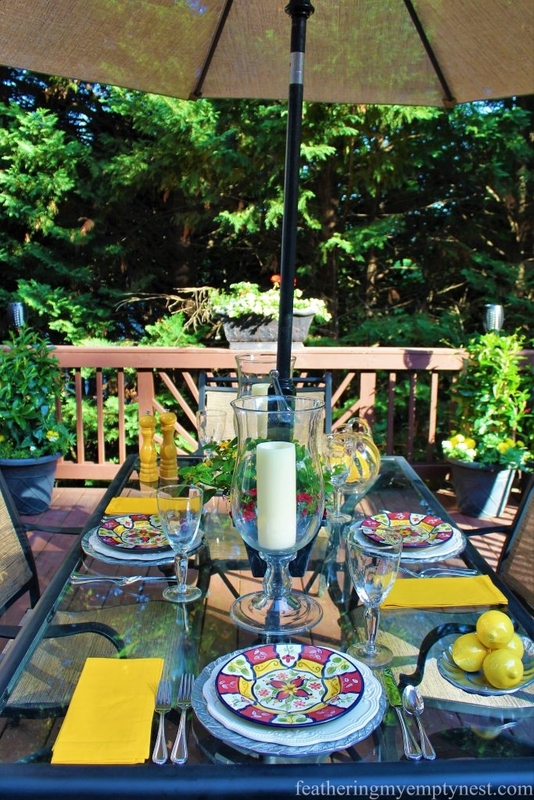 In the meantime, I think I will serve dinner amidst the flowers on the deck tonight. Wow, your deck looks incredible! 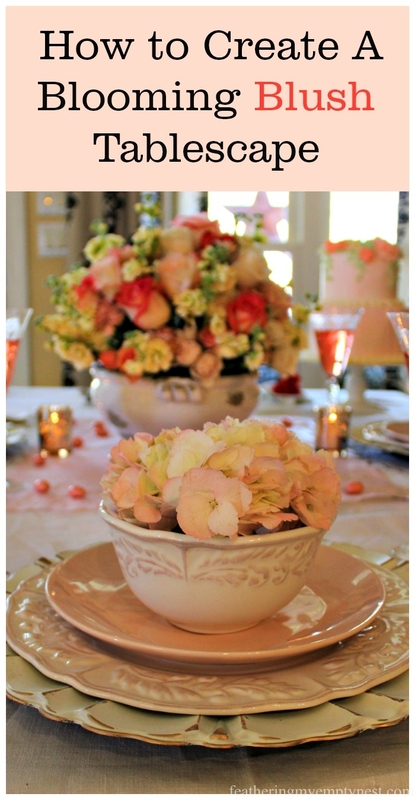 Such a creative idea with the planter in the center of the table. It’s already sweltering outside so hopefully it will cool down enough for you to sit out and enjoy it this summer! What a great idea for your umbrella! With the weather changing it’s nice to be outside. All your flowers make its so inviting. Thanks, Deborah. Happy flower season to you too! Thanks, Michelle. I think herbs in a table planter would be lovely. You could just nip off a bit of basil or thyme and sprinkle them on your food. Also, you could really appreciate the smell of certain herbs like rosemary while you are having a meal. You have a great collection of plants growing. 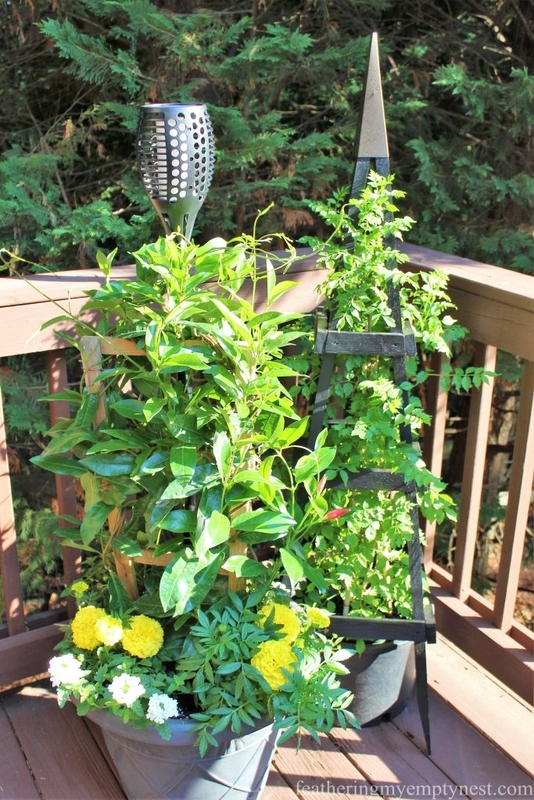 I like the umbrella planter you created- what a great idea! I had a two piece set that you slide around the umbrella but it was a bit too small to grow much. Yours will allow for a much nicer outcome! Thanks so much for your kind comment, Liz. I really appreciate it! Beautiful post Lisa. Lovely ideas for planters. 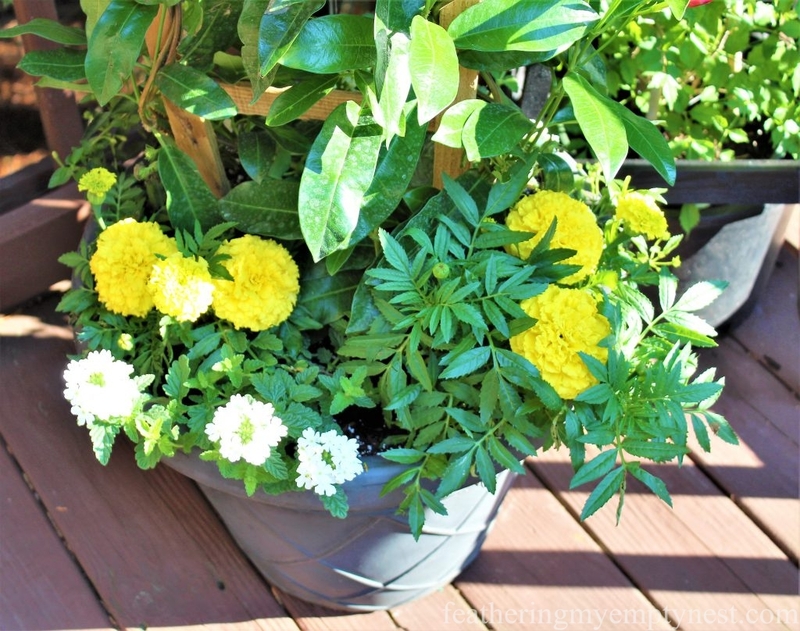 Beautiful containers and I love your DIY umbrella planter…genius! We have a PIke open in my neck of the woods but I haven’t made it over to for a visit yet. 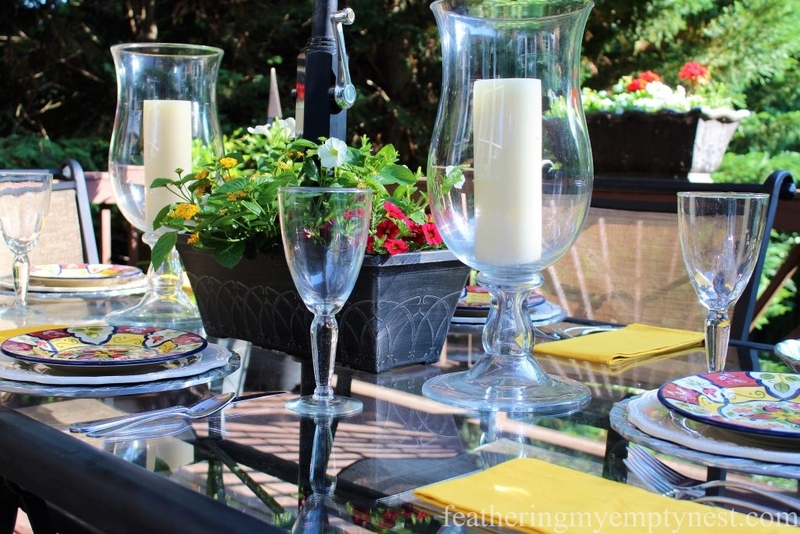 I’m ready for a break in the heat and humidity for some outdoor dining! Thanks so much for commenting, Mary. I agree with you about wanting a break from the heat. It’s been so hot that I am actually considering serving dinner in the pool! 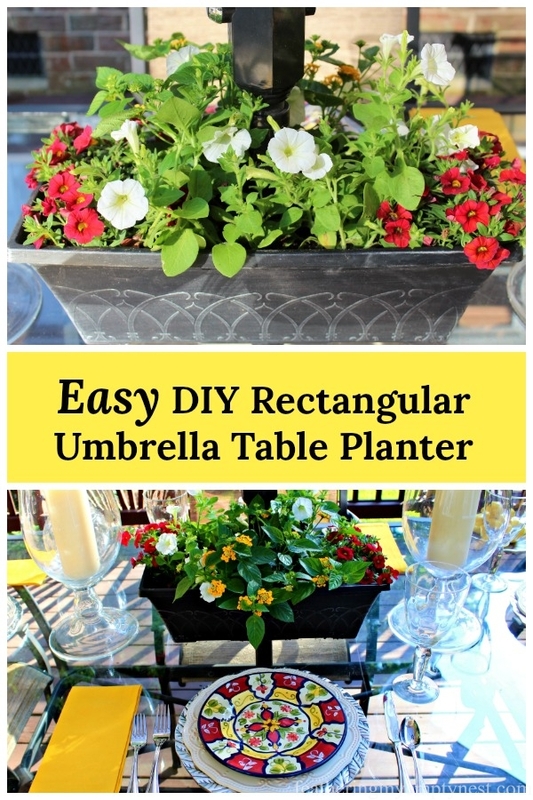 Lisa, the DIY umbrella planter is genius. I need to make one or two of those. 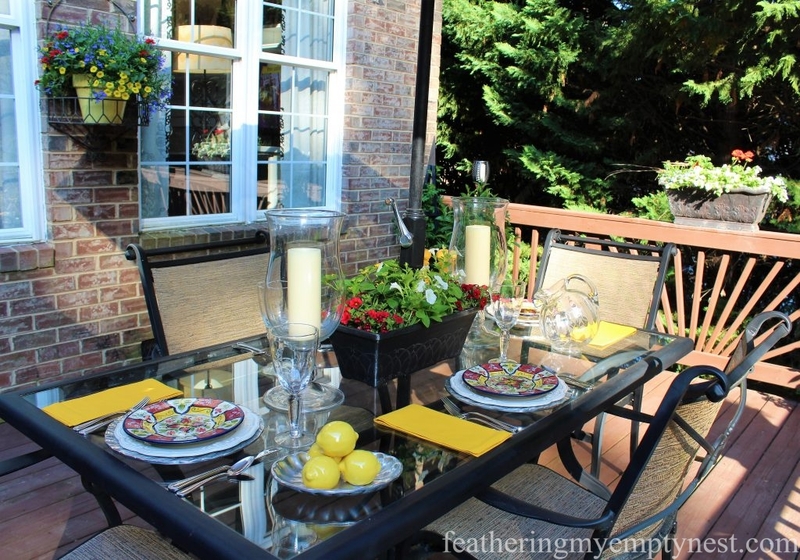 Your alfresco dining space looks perfect for entertaining with so much beauty surrounding it. Thank you for sharing your creativity at Gardens Galore! Thanks so much for your kind comment, Pam and thank you also for hosting Gardens Galore. I love to see everyone’s beautiful gardens.